Airing on September 17, 1972, Etude in Black, the first episode of Columbo’s second season, was ‘event television’ in the truest sense. A big-budget affair with Hollywood royalty John Cassavetes and Myrna Loy headlining the cast, Etude was a magnificent statement of intent for the series, and one which highlighted that the show wasn’t planning to rest on its laurels after the stellar success of its opening season. Columbo’s much-loved basset hounds makes his bow in Etude in Black, with viewers first encountering the slovenly scamp getting his shots at the vet’s after being rescued from the pound. The absolutely perfect choice for a canine sidekick for the crumpled detective, ‘Dog’, as he comes to be known, went on to become the single-most recurring character in the series aside from Columbo himself, appearing in eight 70s’ episodes. His presence here is both endearing and entertaining, but it also has plot benefits as it is the music-loving vet’s rewatching of the Alex Benedict concert in Columbo’s presence that leads the Lieutenant to crack the case over the missing carnation. As befitting a silver screen icon, when Myrna Loy is on-screen as Benedict’s mother-in-law, Lizzie Fielding, it’s all eyes on her. Lizzy’s family money and connections keep Alex living the good life, so when she says ‘jump’, he’s pleading to know how high. It’s perfectly clear who really wears the trousers when it comes to symphony relationships, and Loy also presides over a disciplinary hearing for rogue trumpeter Paul like a boss. The philandering Benedict has a problem on his hands in the shape of thigh-revealing pianist Jennifer Welles. The two have been having a love affair, and Jennifer is now threatening to blow the whistle if Benedict doesn’t leave his young wife Janice. Benedict loves money too much to remove himself from the Fielding family bosom, which can only mean one thing: MURRRRRDERRRRR! So after sneaking round to Jennifer’s house (in broad daylight, wearing a conspicuous disguise, and driving a very recognisable car) he shows his sheer ruthlessness by braining the lass with an ashtray as she lovingly serenades him with a piano ditty. Effectively staged and edited to spare viewers the sight of any actual violence, this is one of the series’ most powerful and memorable murders. 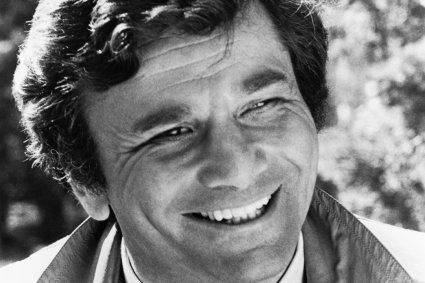 Etude was the first Columbo episode extended to the ‘long’ 2-hour running time (90+ minutes without ad breaks). As a result, a number of extra scenes needed to be shot after initial filming to bump up the running time, including this one where Columbo visits casa Benedict (note Cassavetes’ shorter haircut). I’m generally not a big fan of scenes added in simply to pad the episode out, but this example is a cracker! In a classic unsettling move, Columbo troubles his quarry at a time and place they feel most secure. In this instance, Benedict is enjoying some quiet time at home at the weekend when Columbo shows up unannounced. The Lieutenant spends 5 minutes with the Maestro and doesn’t ask a single question relevant to the case, eventually leaving with an autograph for Mrs Columbo – and the satisfaction of knowing he’s really getting inside Benedict’s head. Nothing beats the simple pleasure of seeing Columbo indulging in some cheeky Chopsticks action at a deserted Hollywood Bowl. Not only is it charming in its own right, but the moment also leads into a delicious hypothetical debate between the Lieutenant and Benedict about whether the Maestro could have committed the crime. This ends with Columbo shattering Benedict’s aura of impregnability by revealing that his superiors are letting him investigate the case as a homicide. There’s even a classic ‘Just one more thing…’ thrown in for good measure. Bravo! Let me know your own episode highlights below! And if you’re keen for a more detailed analysis of Etude, you can read my full review here. Thanks for reading, and check back again soon! Look here, Mr Miyagi, I don’t care if he is waxing the car – I want to see The Maestro right now! Tags: Blythe Danner, Dog, Etude in Black, John Cassavetes, Lieutenant Columbo, Lizzy Fielding, Myrna Loy, Peter Falk, Steven Bochco. Bookmark the permalink. I loved the ending. “Thank you, genius”. I just happened upon this episode on Cozi TV. Cassavetes was a terrific actor, who compelled attention. I know he also became a fine director, but I think he quit acting regularly too soon in his accomplished career. I remember how he came close to stealing the show in the middle of a wonderful cast in “The Dirty Dozen”. Columbo always had great cast members, and this episode was a prime example. Myrna Loy, Blythe Danner, et al. Count me thrilled to have stumbled upon this terrific TV gem! This is one of the most entertaining reviews I have ever read. Am watching the “cigar bomb’ episode” from Season One and look at Roddy McDowell differently since you pointed out how he clearly displays his private attributes. But that was a daring period all around on TV, at least in America. I guess it was one way to get something past the censors. Now its all irrelevant. I guess, and interestingly, the guys don’t seem to feel a need to do it. C: Can I ask you a personal question? C: What do you pay in taxes on this place? AB: 18,000 dollars a year. C: Three times 18, carry the 24, seven down, bring down the zero… place cost you 720,000. C: (whistles.) Could I look in there? AB: Yeah, go ahead…listen, uhh, how did you arrive at that figure, 750,000? C: Oh, it’s a real estate rule of thumb, it’s a trick, no magic, I’m not an appraiser or anything like that. Can I ask you something? C: How much you got in the furniture? AB: (surprised) 200,000, 100,000, give or take a hundred thousand, something like that. AB: Can I ask you a personal question? AB: Did you have anything specific that you wanted to talk to me about? C: No, I’m gonna get to that, but I’m fascinated by money, aren’t you? AB: Yeah, I’m fascinated by money uh but what it can do, that’s all. C: Yeah. Yeah. Anyway, what I was going to ask you is this: how much do you make? AB: I d- uh, that’s very impertinent. How much do I make. C: Well, etcetra, ‘cetra. I make 11,000 dollars a year. So, at 11,000 dollars a year, I got 750,000 dollars for the house, 18,000 dollars in taxes, 200 in furniture, how much help do ya have? AB: I have five, including the gardener. C: You got that, and the money, plus plus plus…Now, 11,000 times 10 years, 110,000, 11,000 times 100 years is 1.1 million, …well, let’s say 900,000. That’s 90 years’ work for me just to live here. Without eating. One interesting fact about this episode is that the actress portraying Janice, one Blythe Danner, was actually pregnant with Gywneth Paltrow during the filming, basically making it Gwyneth’s screen debut. Can’t argue at all with those five moments. I’d nominate an Honorable Mention: When Colombo is at the auto shop and the mechanic suggests he gets another car. Columbo says he does have another car, his wife uses it. But it’s nothing special, just transportation. That would have been sixth on the list! I do like that little exchange. my favourite part which i feel should in there is when columbo takes te young girl audrey who lived next door to identify the lover that used to be arounds columbo expects her to point to AB but instead points to the other innocent loke wuthh the shoulder long hair columbos face changed. This is one of my favorite moments from any episode. I especially like it when Alex tells him he had been up all night thinking about why she would have killed herself and Columbo goes from chuckling “No kidding” to clearing his throat and putting a concerned look on his face “Why is that?”, when Alex says he rejected the idea of her murder. I love when columbo goes to Benedict’s house and the butler goes screaming for “Mr. Benedict, MR. BENEDICT!”. Absolutely bonkers scene, very funny! You picked some great moments there. This is one of my favourite episodes.